If you’re not interested in how to connect a GPS unit to a Mac you can stop reading now. In fact, as your doctor I advise you to do so immediately, this is desperately dull stuff. I don’t normally do this type of thing, but I needed to document this anyway, and I feel morally compelled to make this information available to potential Google searchers. Perhaps it will protect future generations of frustrated GPS hackers from the frustrating death by a thousand cuts I almost suffered in trying to figure this out by myself. It shouldn’t be this hard, but it is, and there’s almost no information out there on how to overcome the many small pitfalls you will encounter if you’re trying to read live GPS data on your computer. A note before we start: I know very little about this topic, really, so beyond what I lay out here I won’t be able to help you out with any other problems you might encounter. This is one specific way of doing things, and I don’t know any other (although I don’t doubt that many alternatives exist, many of them perhaps better and simpler), and I learned this by figuring out everything as I went. This will be the very basic outline of the process that I wished I could have found beforehand. The purpose of the exercise is to get a constantly-updating live reading of your current global longitude and latitude coordinates on a computer. To do this you’ll need a GPS unit. I chose one of the most common and cheapest models available, the yellow Garmin eTrex, which I bought new on eBay for about â‚¬100. You’ll also have to buy a serial cable connection to attach to your GPS unit (it doesn’t come with the unit as you might expect), and a serial-to-USB cable to connect that to your computer (this assumes that your computer doesn’t have a serial connector). I got the official Garmin GPS to serial cable which worked as expected. Caveat emptor when buying the serial-to-USB adapter though; I got a cheap one from Maplin, and the driver software came on one of those mini-CDs that won’t work in a slot loading CD drive like the one on a Macbook Pro. Instead I got a Keyspan serial adapter, which worked fine and seemed fairly Mac-friendly. Install the adapter driver, plug everything together, and you’re all set up. 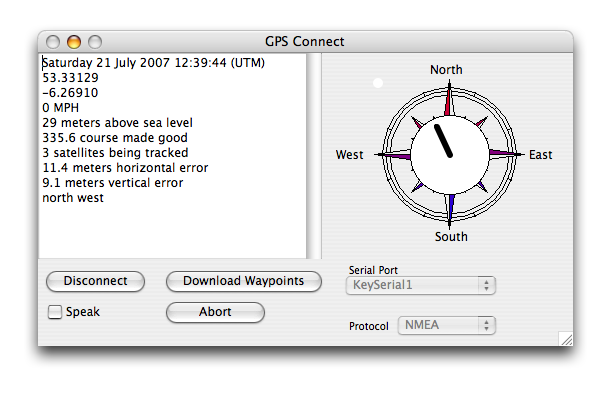 If you just want to view your current location, the OS X freeware program GPS Connect should be sufficient. Once your GPS unit is plugged in and switched on, you can select your serial port (“KeySerial1” if you’re using a KeySpan adapter) and Protocol (“NMEA”), click Connect, and your live GPS data will appear in the app’s dialog box and update as it changes. There’s a PyGarmin module for Python, but as far as I can tell it only supports serial connection to Garmin’s own proprietary GPX format, an XML-like text format for storing saved waypoints and tracklogs (i.e. GPS values that you have already collected and saved on your handheld unit). To get live, constantly-updating GPS values, you’ll need to read data in the standard NMEA serial protocol. To do this, you’ll need to first read the serial data (even though it’s actually coming in your USB port, it’s still serial data), then convert it from NMEA to numerical lat and long values. Luckily, there are Python modules to help to do this. Install PySerial and PyGPS.